A sunset or evening cruise makes any special occasion even more memorable. 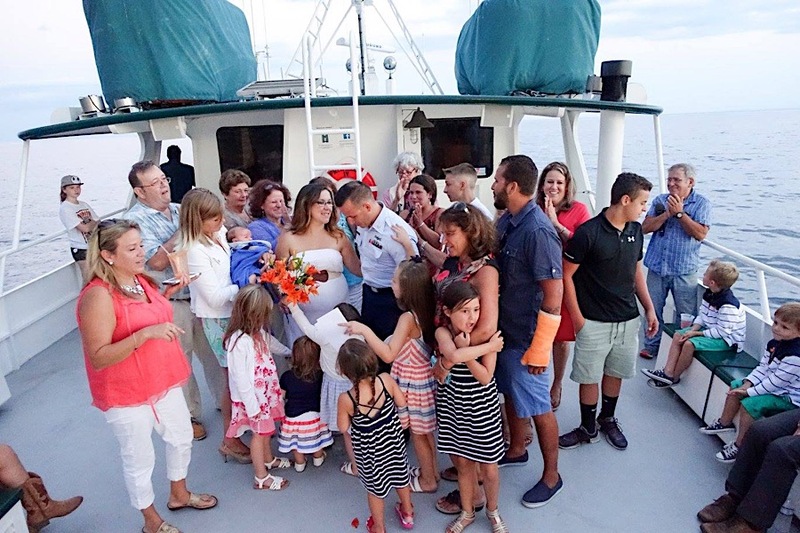 Having a special celebration or party while cruising past the rugged coastline of Cape Ann, or watching the sun set behind Hammond Castle from the middle of Gloucester Harbor, will be a celebration that is remembered. The Privateer IV: The Best Boat Around for a Party! Do you plan on having music (a band or DJ) on your cruise? If so, you probably are going to want space enough to dance. The Privateer IV’s upper deck has a wide-open area for dancing. Compare this feature with any other whale watch boat in Massachusetts and we think you will agree that the Privateer IV is the best for a party! Beside the roominess of the boat, the Privateer IV has other feature that makes for a great sunset cruise. The inside cabin has natural wood tables, cushioned seats, and plenty of room in the aft cabin for a buffet of any size. There is a full bar with draft beer and mixed drinks, as well as snacks and non-alcoholic beverages too. The top deck has PLENTY of room for a DJ or band lot’s of space left for dancing under the stars. We depart from Seven Seas Wharf in the heart of Gloucester’s inner harbor. This is a perfect place to start your cruise because as soon as we let go our lines you will see fishing boats and lobster boats, the Gloucester Coast Guard Station, as well as the entire city skyline. 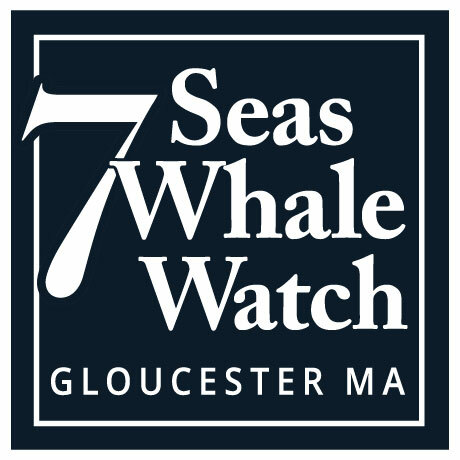 Then we will cruise through Gloucester’s outer harbor and past Ten Pound Island, Normans Woe, and the Man at the Wheel statue which has become the symbol of Gloucester. Where we go from there depends on tide, weather, and what you want to see! One option is to cruise south towards Salem and Marblehead passing Kettle Cove, Bakers Island, and the many small, rocky islands of Cat Island channel on our way. The skyline of Boston is also usually visible on the western horizon. Its amazing how close Boston really is by water! This is a great cruise for anyone, but especially for people from the Salem, Danvers, Beverly, Swampscott, or Marblehead area that may have never seen this part of Massachusetts from an on-the-ocean perspective. Its really a very pretty and under-appreciated part of our coast! A different itinerary would be to head north towards the rugged back shore of Gloucester and on up to the twin lights of Thatcher Island off Rockport. This route takes us past the most rugged parts of the Cape Ann shore. The granite islands and ledges that have befallen so many ships throughout Cape Ann’s history are also what keeps artists and photographers returning to this area again and again to try and capture their beauty. A cruise up the Annisquam River undoubtedly offers some of the most spectacular views of Cape Ann. Make sure the tide will be right when you plan your cruise and you will be able to travel all the way around Cape Ann! To this we must travel through the Blynman Bridge on Gloucester’s Memorial Boulevard (where the famous Man at the Wheel statue is located). From there we travel up the 5-mile long Annisquam River, passing sweeping vistas of Salt Marshes and the white sands of Wingaersheek Beach before reaching Ipswich Bay. If the timing is just right, you might get to see the sunset over the bay which can be one of the most spectacular sights on Cape Ann. Then we travel through Ipswich Bay and around Halibut Point (the very tip of Cape Ann), through Sandy Bay and past Rockport Harbor, then past the twin lights on Thatcher Island and back towards Gloucester Harbor. Regardless of which cruise itinerary you choose we will do every we can to make your sunset or evening cruise a memorable one.